The Sepher Yetzirah is the oldest surviving Jewish esoteric text and a foundational document for Kabbalah. It's origin and date of composition are uncertain; estimates range wildly, from the second century BCE to the sixth century CE or later. Most estimates place it within two centuries of the start of the Common Era. It was long held in high esteem among Jews, who attributed its authorship to Abraham and said that it contained the revelations of Adam. Some suggest that it is the same as the Scrolls of Abraham mentioned in the Quran, or the Sheets of Wisdom referred to in Islamic lore such as the Akhbar al-zaman. The translation below was made in 1887 by a grand magus of the Rosicrucian order and was collected in The Sacred Books and Early Literature of the East (vol. 4), from which I have copied the text and introductory note. The "Sepher Yetzirah," or "Book of Creation," can be traced back to about the sixth century, and seems to fit that period in spirit and philosophy. Enthusiastic Kabbalists believe it had existed — though not in written form — since the beginning of the world. Adam was declared its real author; and it was supposed to be the record of our first parents' wisdom, preserved and written down by Abraham. "The Kabbalah," writes one enthusiast, "was first taught by God himself to a select company of angels, who formed a school in paradise." 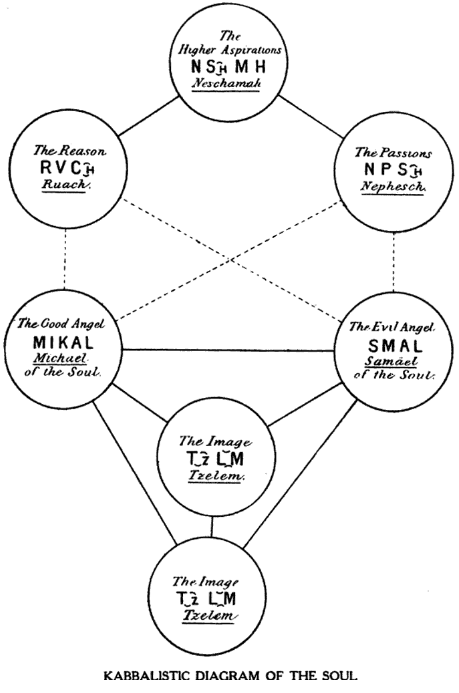 The "Sepher Yetzirah" is, however, little more than an introduction to the main Kabbalah. Five.--He looked above, and sealed the height, with I H V. Six.--He looked below, and sealed the deep, with I V H. Seven.--He looked forward, and sealed the East, with H I V. Eight.--He looked backward, and sealed the West, with V H I. Nine.--He looked to the right, and sealed the South, with V I H. Ten.--He looked to the left, and sealed the North, with H V I. 3. The three mothers are A, M, SH; and in the beginning as to the Macrocosm the Heavens were created from Fire; the Earth from primeval Water; and the Air was formed from the Spirit, which stands alone in the midst, and is the Mediator between them. Source: Sepher Yetzirah, in Charles Home (ed. ), The Sacred Books and Early Literature of the East, vol. 4 (New York: Parke, Austin, and Lipscomb, 1917), 164-180.